What will fit in a 6' Dome? I have a 6' dome and was wondering - how do you plan what scope on which mount based on a pier height of X will work. I tried to look for the mount 3D images that I could import - cannot find. I tried some simple trig exercises and none of them seems to model the RA/DEC rotation correctly. Am I stuck with the known Fork mounted Cass or can I use a GEM - if so what are my limitations and what should I account for? Any references either bounded or URL would be appreciated. I've always done those computations myself, having started out way before canned software was available. Imagine your scope and accessories spinning like a multi-axis, multi-dimensional propeller about all possible axes (e.g. RA, Dec, OTA, etc.) full 360 on all of them, all possible phase combinations That makes it clear that would generate a spherical envelope, centered on the point where the RA, Dec axes intersect. That places an upper bound on how big the interior of your dome wants to be, and where to place the pier. Now, take into account the actually-used phase combinations, discarding the rest. This allows you to pull sections of that spherical envelope inward... and that may be circumscribable by a sphere that is smaller than the original one, defining a least upper bound on the needed dome interior size, and a (possibly new) location for the pier (typically S or N of dome center). My domes are geodesic, so I had to perform the additional step of visualizing rotations of the dome itself, and solving for the largest sphere entirely circumscribable by that. Then, as a last step... add some comfortable margin... and build! I have an 8' dome with similar equipment to what you mention. Mine is set up for remote operation, so I'm rarely in the dome except to fix something - and that is a good thing... The other day I was wondering where the knot on my head came from and remembered hitting it on the on the scope's camera the day before. I seem to regularly run into the scope or counter weights or some other protrusion. That said, my advice would be go fork mount or keep it small or buy a helmet and padding! Very insightful - I thought of this, but considered the inaccuracy of that centered vector. But I suspect the coordinate offset from the center of the mount - then taking the radius will give me a better idea. let me try this later this weekend - no time during the week hence the importance of the observatory. As my-spot alludes to, give consideration to how you'll use your observatory. If you're going to be an imager, your observatory can be smaller than it would be if you are going to observe visually. If you're going to be inside your dome when your scope is operating, you'll need plenty of walking around room (and sitting at the eye piece room). I have 24"- 30" of clearance all around my scope in my roll-off roof observatory and wish I had a few inches more. So looking to re-utilizing one of the rubber maid sheds instead. What I liked about the slotted dome - it helped to reduce the stray environmental terrestrial lights, and it does a great job. But fitting a 8.5" dome and associated support does not fit. Even though my wife gave me the volley ball area, still OMG! I used to have my 10 RCOS in a 6-foot dome. 4mm clearance front and back, with counterweights on the front of the OTA to slide it back so equal spacing from front to centre and rear of the camera to the centre of the pier. Very tight, it was an imaging set up. Not a visual configuration. Now I have a 14 inch SCT in there for imaging. Think R2D2 with a big eye. I made models and set it on the mount to see if it fit. A large sheet of plastic, rolled and gaffa tape to resemble the scope. Not high tech, but it worked. In my humble opinion, you are trying to put 10 lbs of potatoes in a 5 lb sack. Here is the drawing for the ME2 which is similar in size to the ME http://www.bisque.co...ia/p/71810.aspx . Frankly, I wouldn’t put anything bigger than an MX with an FSQ106 in a 6’. Draw a circle in chalk in your garage or on the sidewalk that is 6 ft diameter and see if you and all the stuff will fit while having a glass of wine . Also take into account that the only working dimension is actually a 5 ft diameter circle because of the framing and try not to split your head on the dome. Put the dome on a larger structure so you can use it without not even being able to work on your equipment. Edited by greenstars3, 02 April 2019 - 10:55 PM. 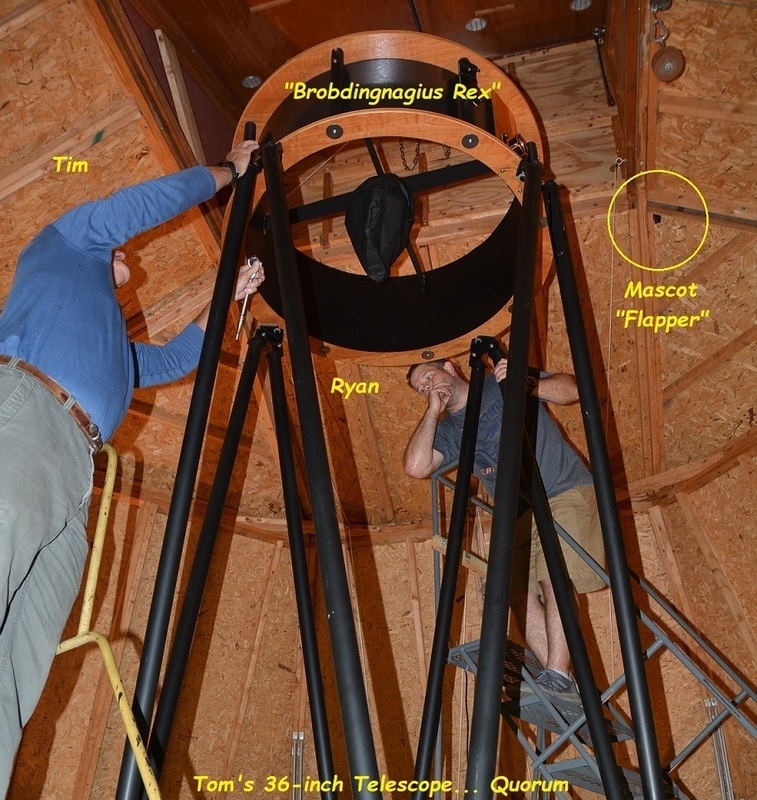 It really depends on how much time your planning on spending in your observatory. If you have a clamshell dome like an Astrohaven and are doing astrophotography only then you can fit a 16" scope in their 7ft product. On the other hand if you are solely doing visual astronomy an 11" SCT is probably about all I would try and squeeze in something up to 8ft like a SkyShed POD. I think you should also ask do I need a dome or do I really just need a permanent setup with a cover or motel-o-scope. Overtime I'm coming back to the virtues of a simpler permanent setup or a clamshell because it offers a lot more flexibility. While wind becomes more of an issue I tend to find that surface wind and seeing our highly correlated so nights with significant wind aren't good for astrophotography anyways.